Note-less and silent as to provenance the purchaser is on his own with these two Cologne (but see below) recordings of Kleiber�s Dvoř�k. Kleiber was joined by Antonio Janigro for the Cello Concerto though Janigro is now probably best remembered as conductor of I Solisti di Zagreb. In point of fact he had been a particularly distinguished cellist and was devoted to this concerto. He recorded it for Westminster with Dean Dixon conducting the Vienna State Opera Orchestra. 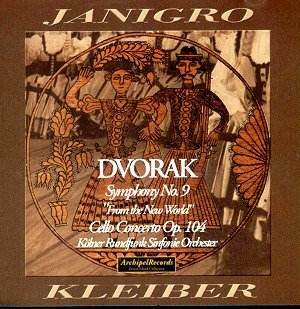 Whilst it�s really more a matter of academic interest than anything (at least until that disc is returned to currency, if it ever should be) Janigro responds that much more vocally and intensely in the live recording with Kleiber. It�s by no means a cast iron performance. The Cologne horn section seems to have been rather fragile � as was the section in the previous year in the companion Ninth Symphony - and there is poor playing in the opening movement of the Concerto, though the principal flute is excellent. Tension can dissipate as well from time to time though Kleiber holds things on a rhythmically tight rein. Janigro�s tone is tightly coiled and he�s not free of reproach when it comes to tidiness but it�s a whole-hearted reading, let down by some disc bumps and far too much knob twiddling in the Cologne studio to contain tuttis. The warmly flowing slow movement is very acceptable and there�s ardent and expressive playing in the finale though also one or two clipped notes in the recording set-up. The Concerto has been released before on Arlecchino. Technical problems are as problematic in the Symphony � perhaps rather more so in fact. It was released on Movmento Musica back in 1986. The audience is a typical bronchial November one and the sound is rather scuffy, the recording as such occasionally wearyingly braying. This must surely have been recorded on tape but it sounds to me as if Archipel has found an LP source from which to transfer because there is a passing but dislocating and entirely repairable locked groove in the first movement. Thoroughly poor show to have left this for our delight. There�s also a problem in the scherzo, from 6.30 onwards - it sounds like a clipped note � but significant enough to warn prospective purchasers. The performance is notable for one thing in particular and that�s the awesome string playing Kleiber elicits in the slow movement where, for one hallucinatory moment, I swore I was listening to a vocal choir not a string one. Quite astounding. Elsewhere he packs in some swoony dynamics in the opening that take a bit of getting used to and the playing is not always watertight. This label claims that this was the Cologne orchestra but authoritative sources elsewhere claim it to be the Berlin State Opera and I�ve amended the track details accordingly. Obviously it would take a very strong coupling of these two works to entice purchasers who might not otherwise respond to Kleiber�s name. For the latter it�s a strong purchase; for generalists there are strong caveats along the way. Sample the slow movement of the New World if you can, though. Hear a magician at work.